Are firms ever going to empty their war chests? UK private non-financial corporations (PNFCs) consistently ran a financial surplus between 2002 and 2013. They now hold around £1.8 trillion of financial assets, including £0.5 trillion of cash. This has attracted attention from policymakers and the media. Should we expect companies to spend these assets to finance investment? The MPC considers this to be possible (see e.g. the February 2015 Inflation Report). Many agree, calling on companies to spend their ‘cash hoards’ (see e.g. these articles in the Telegraph and the FT). Here, we explain why we think companies are unlikely to run down their assets significantly. This does not mean that they will not invest; rather, they will not necessarily finance investment through liquidating assets. There are two ways to think about the PNFCs’ financial balance (also known as net lending / borrowing). On the real side, i.e. in the capital account, it is the difference between companies’ income and their capital investment; a surplus implies their income exceeds investment. On the financial side, it is the difference between the change in their financial assets and their liabilities; a surplus means companies are accumulating financial assets faster than liabilities. Chart 1 plots both measures using aggregate National Accounts data, where the difference between the two lines is the statistical discrepancy. In this blog post, we focus on the financial side. Source: ONS National Accounts (a) Includes bank loans and foreign direct investment loans, among others. (b) Debt securities except short-term assets, which are included in cash. (c) Equity and investment fund/shares. (d) Currency and deposits, and short-term debt securities, like money market instruments. (e) Includes: pension schemes, financial derivatives and employee stock options, and other accounts payable. Chart 2 decomposes the financial surplus into assets and liabilities that companies have been accumulating over time. 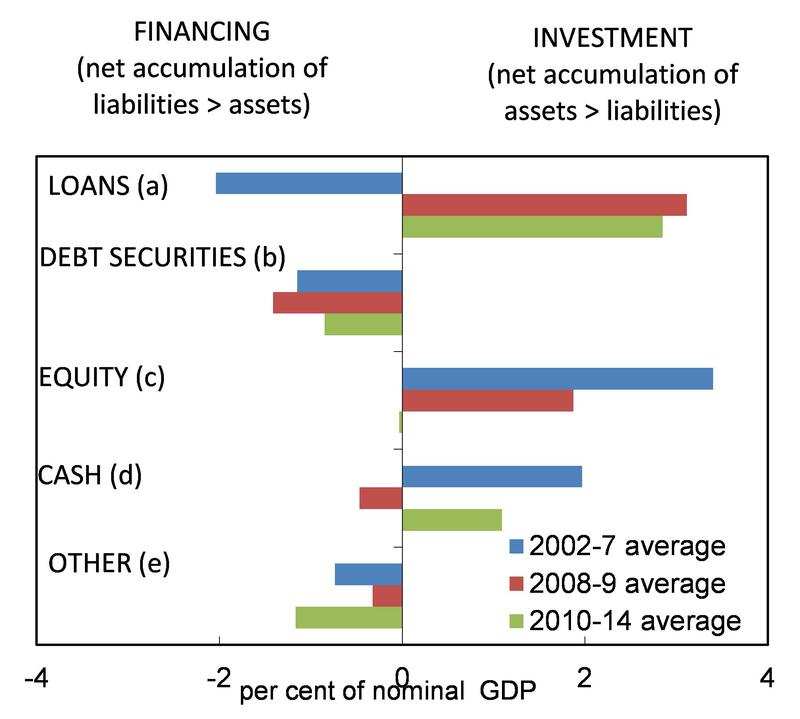 Despite running a large financial surplus in the run-up to the financial crisis, UK PNFCs were net issuers of debt, in the form of loans and debt securities (blue bars in the top two panels of Chart 2). Since the recession, they have been repaying loans, but have continued to issue debt securities. Between 2002 and 2012, companies have invested their excess resources into holdings of equity assets. And with the exception of the financial crisis, they have also accumulated cash (which throughout this blog we define as currency, deposits and short term investments, like money market funds). Turning first to the equity holdings companies have accumulated. These flows represent a genuine accumulation of assets, rather than simply share buybacks. But we do not see these holdings as a financial resource that is readily available to finance domestic investment. This is because around two-thirds of these assets are foreign equity, likely representing ownership of property overseas and Foreign Direct Investment (FDI), where UK PNFCs form a long-lasting relationship with a foreign company, and have a significant degree of influence on its operations. This view is supported by data from company-level accounts of UK listed firms (our dataset is the same as that in Farrant et al. (2013), see the link for more details). They show that firms hold significant fixed assets on their balance sheets but few financial investments. It is also consistent with the information received from contacts of Bank’s regional agents. So, in our view, the assets which the National Accounts classify as equity are not a financial investment that is likely to be liquidated as a means of raising funds for domestic investment projects. But what about the £0.5 trillion of cash that companies have accumulated? As we explain below, we also find it unlikely that companies will spend this to finance investment. This is because we believe they have accumulated it for structural, rather than cyclical, reasons. National Accounts data show that in 2014, UK PNFCs’ cash holdings reached a record level in absolute terms, and in 2013 they reached a record relative to GDP and to companies’ total liabilities. Companies in other advanced economies, for example the US and Canada, have also accumulated large amounts of cash. Will they spend it to finance investment? That depends on whether it has been accumulated for cyclical or structural reasons. If cash was held for cyclical reasons, for example as a response to the financial crisis, we might expect companies to run it down in the next stage of the cycle. But it is clear from Chart 3 that in the UK, this rise in cash holdings has been a long-term trend, which started over a decade ago. In fact, in the crisis, companies slowed down their accumulation of cash, and even ran it down a little, using it as a buffer, as we might expect. Firm-level data for listed companies also show this pattern of behaviour. Source: ONS National Accounts. (a) Cash measured as: currency and deposits, and short-term debt securities, like money market instruments (b) Companies’ value measured by companies’ total liabilities. So what are the structural reasons behind this long term trend? To shed light on this, we focus on two possible reasons for companies to hold cash: (i) the transaction motive – to minimise the costs of converting other assets into cash to then use for payments; and (ii) the precautionary motive – to be in a better position to cope with adverse shocks when access to finance is limited. Other reasons, which are beyond the scope of our work, include tax benefits of holding cash and the agency motive, among others. Source: Thomson Reuters Datastream and authors’ calculations. (i) Companies have increasingly preferred to use cash rather than inventories as the buffer to deal with shocks. The coefficient on net working capital is significantly negative, meaning that companies’ holdings of cash are inversely related to their holdings of assets for which cash is a substitute. And companies of all sizes have significantly reduced these other assets over time, for example by running down their inventories (Chart 4). This is the case across various industries. (ii) The volatility of companies’ cash flow has risen, including during the ‘Great Moderation’. The coefficient on cash flow volatility is significantly positive, consistent with companies holding cash for precautionary reasons. But, perhaps surprisingly, the volatility of companies’ cash flows rose during the 1990’s and early 2000’s, likely contributing to the rise in cash holdings at that time. (iii) Companies hold more intangible capital on their balance sheets, which cannot be pledged as collateral when borrowing, encouraging them to hold more cash rather than rely on external finance. Falato et al. (2013) use a new measure of intangible assets to show they were ‘the most important firm-level determinant of corporate cash holdings’ for US firms. Consistent with this, our results for UK companies show that cash holdings are positively related to R&D expenditure (as a ratio of sales), which has risen over the past two decades, particularly for the largest companies. The same set of factors have been found to explain the long-term rise in US and Canadian companies’ cash holdings (see Bates et al (2009); and McVanel and Perevalov (2008)). In fact, putting these factors together implies that UK PNFCs’ cash holdings should, if anything, have been higher in recent years. Survey and anecdotal evidence also supports our conclusions. In the 2015 Q2 Deloitte CFO Survey of large UK companies, CFOs expected PNFCs to increase their cash holdings over the next 12 months, as was the case in most of the previous quarters. Similarly, information from contacts of the Bank’s regional agents at large and small UK companies suggests that a lack of access to bank financing during the crisis has led them to increase their cash buffers permanently. Contacts also stressed that there was little benefit to them in holding large amounts of excess cash, because of its low return. So they did not consider their cash balances to be excessive, nor did they expect to run them down significantly to finance future investment. One exception is the July-August 2014 survey by the Association of Corporate Treasurers, which provided a slightly more nuanced message: 43% of respondents expected cash holdings to remain above their pre-crisis levels, but 75% planned to reduce cash from its current level. Overall, our results show that UK companies are unlikely to run down significantly the financial assets they have built up over the past decade to finance investment. Their equity assets seem to reflect strategic holdings in other companies, rather than financial investments. And cash has been accumulated for structural reasons, including as a reaction to greater volatility in cash flow and because of a preference to hold cash instead of inventories as a buffer to deal with shocks. 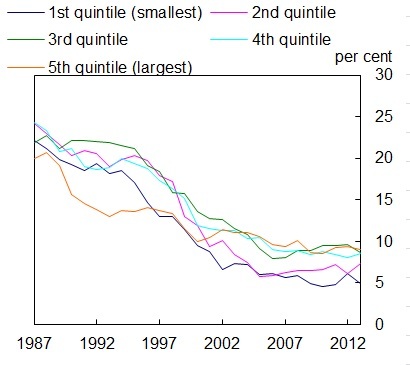 Previous Post Human capital depreciation during unemployment – does it matter for monetary policy? Next Post Drivers of long-term global interest rates – can weaker growth explain the fall?